Fictional blogs have been lauded by journalists as a "hot new literary trend that has revolutionised publishing." 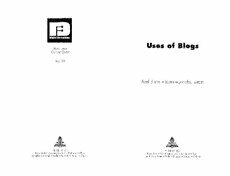 A fictional blog can be defined as any form of narrative that is written and published through a blog, LiveJournal, or other similar online Web journal. To date there have been a number of blogs that have been published in the mainstream print media, some of them nonfiction (such as Rebecca's Pocket), some fiction (John Scalzi's Agent to the Stars), and others whose real/fiction status is ambiguous and contested, such as the Bene de Jour (a blog about a London call-girl). Although the claim that fictional blogs are revolutionizing publishing might be overstating the current situation, fictional blogs are nevertheless an emerging phenomenon with much potential, particularly for younger and emergent writers. Blog fiction is a way for budding authors to experiment With their style, find their own narrative voice, and workshop their ideas with the possibilities of audience feedback. According to Faleiro, for authors of blog fiction, "the blogosphere thus acts as a cocoon; a space where writers feel appreciated and encouraged, and can identify and define their skills."